Our investigations began about four years ago when four friends decided to go check out some supposedly haunted places in our area. 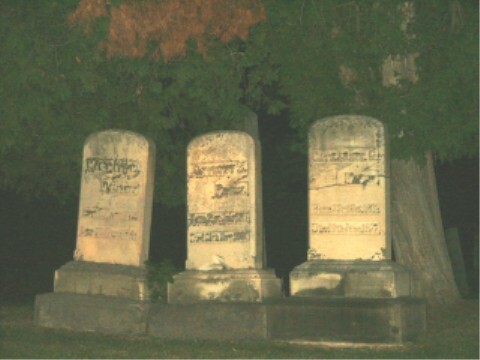 The early investigations of the group of friends included driving through a cemetery, taking 35mm pictures with the car windows barely down and driving away as quickly as we could. Since those first few trips out, we have learned much about investigations and documentation and procedures for valid research. What we know about the paranormal has not changed much, but what we theorize and what we may believe has certainly evolved. Our investigations now still include explorations of cemeteries, but we also do locations both public and private, at clients requests and at our own or others' iniatives. In the years we have been doing investigations, we have grown as investigators and as people. Storm uses video recordings, audio recordings, temperature and EMF readings as well as digital and still photographs and other methods. The following are some of the more memorable investigation sites and evidence we have collected. Although permission was granted to document these investigations, the exact locations will not be disclosed. One of us will contact you as soon as possible. Please enjoy the photographs. Pictures will be updated as often as we can. Please see our FOG pages for more photos and evidence gathering. We have conducted a few investigations in 2008 already, even though it is still very early in the year. We hope to be able to share some of these experiences with you all and discuss what we have and have not found in our research.